Growing up I hated beans, I mean really hated beans. My mom made beans multiple times a week hoping that I would grow to appreciate them eventually, I didn't. It took me until I was an adult to fall in love with the delicious flavor that beans can lend to dishes. I was pleasantly surprised when I first gave my two boys beans, they absolutely fell in love with them. Many times when I make a recipe that has beans as an ingredient, the beans are the part of the dish that is eaten, the rest of isn't touched by my two sons. The July/August issue of the Food Network Magazine had a recipe for Baked Beans with Swiss Chard, which looked like a nutritious bean dish that my whole family would love. This recipe has 15 ingredients, including salt and pepper. The total time is approximately 1 hour 15 minutes, 20 minutes of which is active. The majority of the time is in the oven, the actual prep work is minimal. I had no problems finding any of the ingredients at my local grocery store, with the exception of a 15-oz can of whole tomatoes. The only size available was 28 oz, so I used by kitchen scale to measure the correct amount for the recipe. Additionally, I have never actually seen Swiss chard at any of the stores in my area, so I substituted mustard greens, as the recipe suggested. Finally, I chose to use smoked ham over turkey, I prefer the flavor. I followed the remainder of the recipe as written. My husband and I really liked this dish (the pictures didn't turn out very well and don't do it justice). 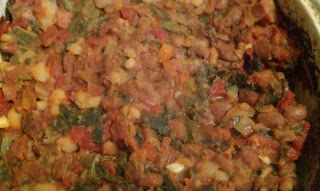 I liked that it has mustard greens and beans, which are a great healthy combination. As expected, my two boys picked out the beans and didn't want to try the rest. Make sure to adequately salt the dish, it will need a decent amount of salt. Overall, a great way to get more nutrition into your family's diet, with minimal effort. For the recipe go to Food Network Magazine Baked Beans with Swiss Chard. order to find the list. Respawn and Microsoft collaborated on the Xbox One controller recalibration. that is integral to it.